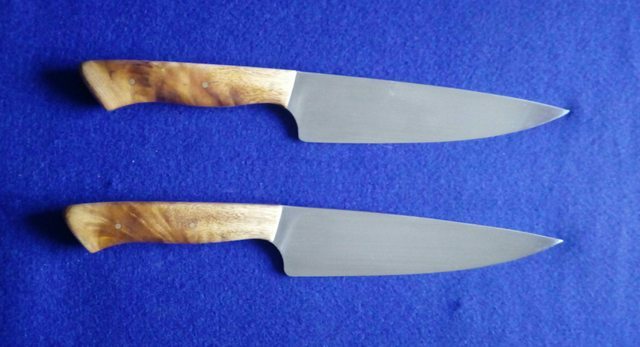 A couple of weeks back I was asked by the manager of the Eucalyptus plantation if I would make a chef knife for the owner of the property so he could give it as a gift for Christmas. I have plenty of eucalyptus cut and drying with some ready to go but he wanted something special for this knife so we spent a couple of hours sorting through his 16 cubic meter heap of very dry wood and I found a couple of blocks that I took home and cut and held in my light box. 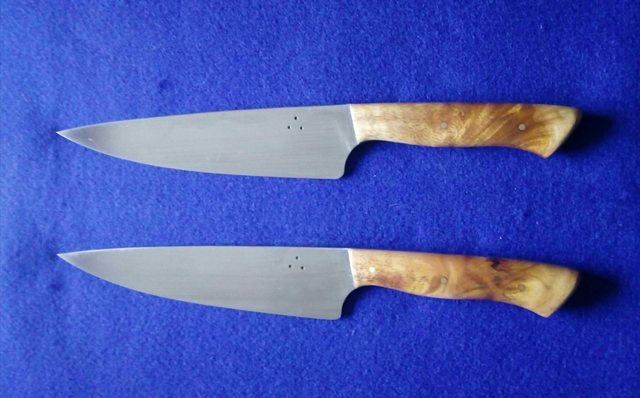 I decided to make two of the chef blades as it sometimes happens with the more figured eucalyptus among other woods that with high figure comes the possibility of a fissure or other flaw that only becomes apparent as you work down in the shaping process and so I wanted to have a back-up in case that occurred this time. 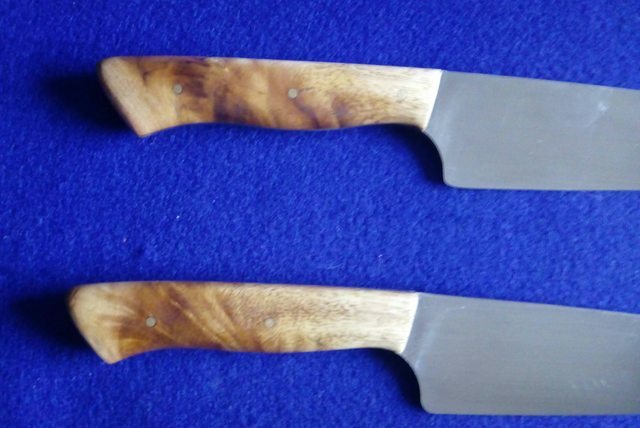 There was a couple of very minor fills I had to do on one of the handles but they are both worthy of presentations so will give him the choice of the two of them when he comes in to get it. The property owner has a sea going fishing launch so the knife is for the galley and as bench space is at a premium in these situations I decided that a knife block or any of the fancy styled bench top knife holders was not an option and so made a simple leather cover to protect the blade as it will inevitably be stored in a drawer. Absolutely beautiful! The eucalyptus looks fantastic. The overall design of the knife is superb. Nice looking knives there Vonn. Vonn you definitely have the eye for detail. 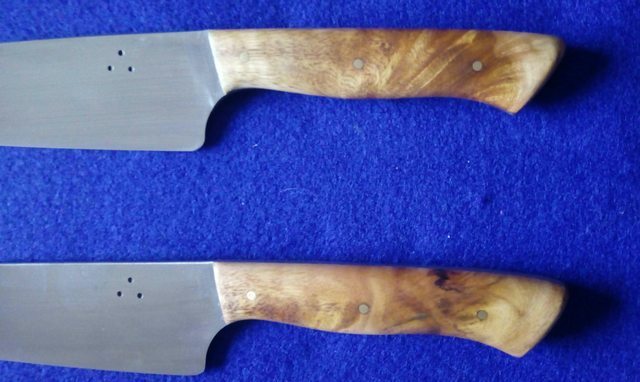 How long have you been making knives? 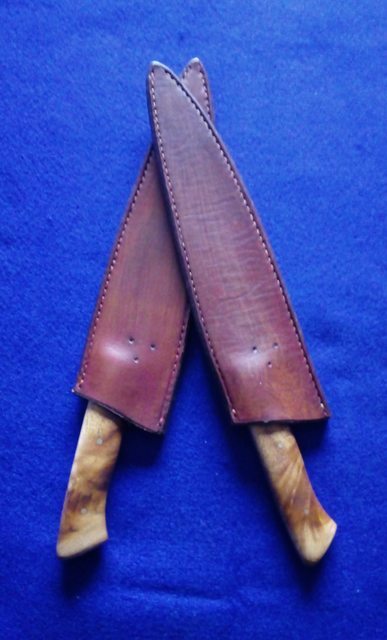 Was making the odd one for myself since I lost a store bought one in the 70's but wouldn't have made more than 10 over the years untill it all kicked off about 12 months ago when I showed a WIP on two hunting forums so it has gone from there with over 150 knives made and sent off since then. Started with a 2x36 on the end of a bench grinder and built all my own gear since then to keep up with the increased demand. All self taught but I did know what I was wanting to aim for and design is something I have had as a critique on knives I have made and seen over the years. Like I said earlier you picked the right wood for those handles. Excellent work!